“Hook Up” is a young teenage fiction book that takes readers on a journey with Cody Manywounds, a First Nations teenager from the Tsuu T’ina Nation who is trying to find his place in the world. In the past, Manywounds had gotten into trouble with two of his best friends Silas and Jarrod, and as a result of that trouble, the police and social services became involved. 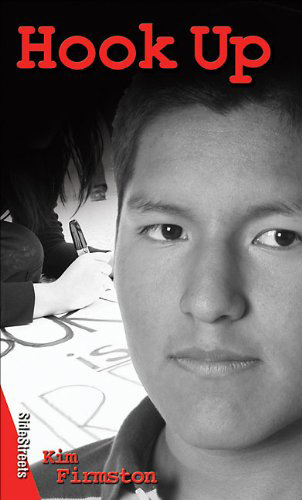 As a Native living in Calgary and not on the reserve, Cody faces a lot of racism at school. He says, “yeah there is an anti bullying policy but that seems to only work on paper.” He is called names like “chief, spear-chucker, or injun,” and if he skips a day of school, the teachers think it’s because he’s been drinking and not because he had a cold. After taking up jiu-jitsu, Cody’s life turns around for the better. He meets his jiu-jitsu sparring partner’s twin sister Miranda, and thinks she is hot. His grades are good and the escape to university (and more girls) is just around the corner. Manywounds gets caught up in his feelings for Miranda and loses touch with his friends and what they are going through. It is after one night of fooling around with Miranda that he finds out she is pregnant. When he gets a text message from Miranda saying, “I’m pregnant, call me” Cody finds that his plans to go to university could be torn to pieces. Miranda, an athlete herself, is supposed to be going to university in the fall on a soccer scholarship, but with her pregnancy, she finds that she has to make the toughest decision possible—to get an abortion. Cody then finds himself dealing with conflicting emotions, and discovers how little a say he is given in the matter, and this causes both Miranda and Cody heartbreak. In one sweep, Cody Manywounds has to grow up and learn that there is more to the world than just himself and his feelings to consider. Written by Kim Firmston, “Hook Up” is powerful, well written, and suspenseful with characters that are appealing, convincing and complex.